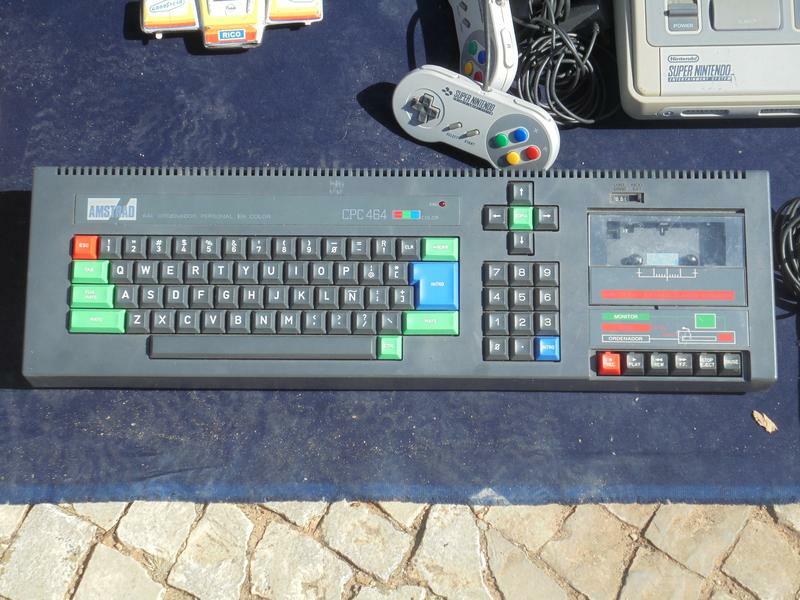 Spotted at the antiques market in Vila Real on Saturday, an Amstrad CPC464 home computer. State of the art between 1984 and 1990, £250 bought you an astonishing 64K of RAM!! Somewhere in the loft I’ve got an original Spectrum ZX that I spent hours and hours playing “Football Manager” on, it was just a maths programme that generated results but... back in the day, hey? Alan Sugar and Clive Sinclair helped many of us to get into computers. Taught myself BASIC programming on a tiny ZX81 with the membrane keyboard and a wobbly RAM pack plugged to increase its capacity from 1 to 16k. Stood me in good stead when computers were introduced to the office in the early 80s. I had none of the technofear of many of my colleagues. Wow! we had that very model of CPC 464, with its own green-screen monitor. You loaded software on cassette tapes but later we upgraded it and bought it a 'disc drive'. I actually used to TYPE in programmes from pc magazines - pages of them - and then oh such fun when all you got was an error message, and had to read through lines of code to spot one tiny comma in the wrong place. And all so you could guide a tiny blocky stick man down a screen to land safely on a square ("Parachute") - though we did have one cracking typed-in game, "Bouncer", which had very speedy game-play and involved a ball rebounding between 'cotton-reels'. I held the record on this, which my husband could never beat, much to his annoyance! I've had many computers since, most of which I've put together myself, but never loved one quite so much. Thanks for the nostalgia!